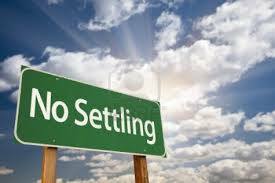 Yes, You Are SO Settling! 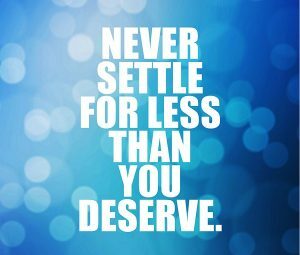 When was the last time you heard someone say: “I’m just not willing to settle”? When was the last time YOU said that very phrase? I hear people say that line all the time, usually in reference to dating-relationships or jobs. People can even get kind of righteous about not settling in these areas. And really, why would you settle for anything? 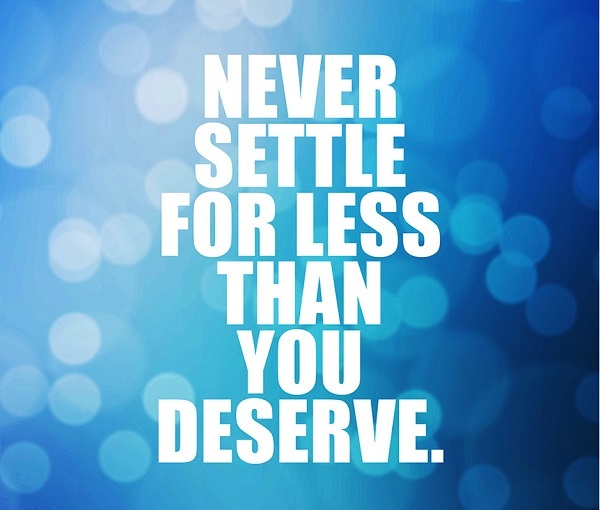 Why should you settle for, or be satisfied with less than what you truly want? BUT… I the truth is, people settle all the time. The crappy part is they don’t even know they’re settling. That’s right. Even if people stick to their guns in the arena of relationships and work, refusing to settle for less than what would leave them truly satisfied, they still settle all over the place in their lives. Every time we keep our mouth shut and don’t speak our truth – settling. Every time we pretend we’re ‘OK’ with something when we’re not – settling. Every time we cover-up or avoid acknowledging something that’s bothering or concerning us – settling. Every time we tolerate something instead of standing up for ourselves – settling. We constantly settle in our lives. In an effort to avoid rocking whatever boat we think we’re on, we settle for how things are instead of the possibility of how things could be. Despite what we’d like to believe about ourselves, for most of us we’re in the midst of a settling epidemic and the vaccine seems like it’s way out of reach. When you start to think of settling as the idea that anytime you accept how things are instead of standing up for how you want them to be, it kind of changes your perspective on how you see yourself in your life doesn’t it? The truth is none of us want to be ‘settlers’ in our lives. None of us wants to just ‘take it’. We all want (even if it’s a secret want that we don’t talk about, contemplate, or maybe even acknowledge) a life where we feel powerful and happy. We all want to believe that we’re playing the game for ourselves (and of course those that are important to us) to win. The thing is, every time we settle we’re not playing that way. We’re losing out on what’s possible for us, our relationships, and our lives by not speaking up and being honest. That might be uncomfortable enough to sit with, however in an attempt to really get you motivated to make a change for yourself and your life, let’s take a moment to look at the impact this settling behaviour is having in your life. 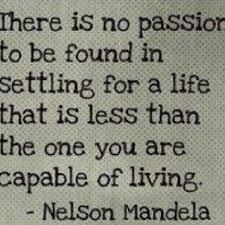 Where are you settling into your life? Where are the places you’re not saying what you really want to say? Where are the places you’re tolerating behaviour (from yourself or others) that doesn’t work for you? Where are the places you’re sitting down instead of standing up? Then ask yourself, how do you feel in these areas of your life? If the answer is anything less than “totally satisfied” (or better) then consider you’re settling and that’s having an impact on you, how you feel about yourself, and how you feel about your life. 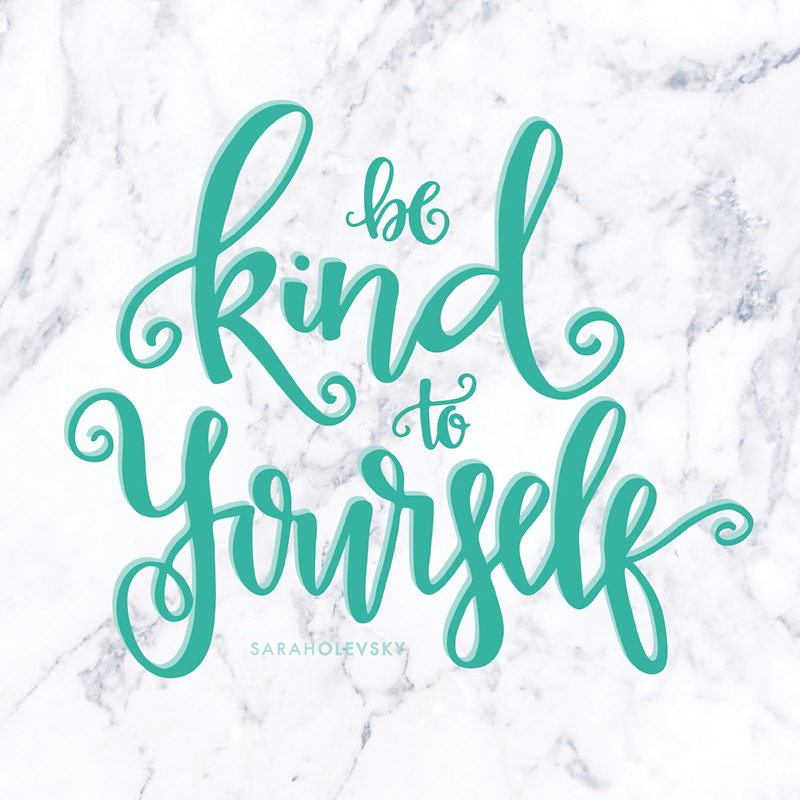 Think of a time when you actually took the risk to say what you needed to say… How did you feel about yourself when you were done? You may have been shaking from the adrenaline rush, and at the same time wasn’t there a sense of pride and wonderment for yourself? Didn’t that feel awesome? Before I go into this, please let me say that making a change like this – a change in ingrained patterns of behaviour in yourself – is NEVER easy. If it was easy, everyone would do it and we’d all be living “totally satisfied” (or better) lives. But the truth is it’s not and therefore we’re not. Making a change in your life requires patience and perseverance with yourself, recognizing that you’re not going to be perfect at this right out of the gate. You’re going to have to be gracious with yourself when you slip into the old familiar pattern and determined enough when you notice the slip to pick yourself up, dust yourself off, and get back in the game. Now let’s get down to business in eradicating this ‘settling epidemic’ from your life! Well as with anything else in life – you can’t change that which you don’t acknowledge – so the first step in curing this demoralizing disease is to recognize and take ownership of the fact you’ve been doing this in the first place. This is never a comfortable thing to do, acknowledging where we’ve been letting ourselves down, however, it’s an extremely necessary step in any process for change. #2 – How Do You Want It To Be? Once you’ve taken ownership of something, you automatically empower yourself to be able to change the situation. When you sit in denial about anything, you also deny yourself the power to change things. So… now that you know you settle, look at the places in your life you do it the most or look at the areas that have the biggest impact and imagine how you’d like it to be instead. Think about what it would be like if you were “totally satisfied” (or better) with the communication in your marriage, with that friend or family member who always seems to kind of undermine you, with your personal trainer who you feel is kinda ‘phoning-in’ supervising your workouts – or better yet, with yourself if you’re phoning in your workouts!! Just look at the places you aren’t “totally satisfied” and think about how you’d like it to be instead. #3 – Where’s The Gap? Next, you need to figure out what’s missing. What’s missing that if you were to add it to the mix would change things or make a difference? Let me explain that in slightly less ‘coachy’ language: what are you not doing/ saying that you know you need to do or say. Better yet, who are you not being that you know you need to be to make a difference? Are you being passive instead of powerful? Are you hiding out and avoiding instead of being courageous? Are you being half-assed instead of committed? If I were being powerful in this situation, what would I do or say? If I were being courageous in this situation, what would I do or say? If I were being committed in this situation, what would I do or say? If I were being __________ (you fill in the blank) what would I do or say? Often the answers we need are just right there when we ask ourselves those types of questions. Once you’ve figured out what you need to do or say and how you need to be being to create “totally satisfied” (or better) in your life, all there is for you to do is do just that – whatever it is you know you need to be/ do/ say. It’s really that simple in theory. Obviously, as I stated before, making a change like this is never easy. It takes commitment and grace to be able to do this effectively. It takes something to have a frank conversation with your personal trainer about how you feel regarding their performance. It takes something to speak to your friend/ family member about how you feel. It takes something to live a life that you feel “totally satisfied” (or better) in. You deserve to live a life that lights you up and leaves you feeling generally happy and powerful. PS – If there’s any way I can help you figure out what you need to do/ say/ be in an area of your life that’s not working, don’t hesitate to get in touch. This stuff is never easy to put into action on your own. We like to think we will, we talk a big game to ourselves, maybe we even start the process, but inevitably making real change without support is unnecessarily hard. Let’s do it together instead! Contact me for a free consultation and we can also talk about my special spring rates! !